1. 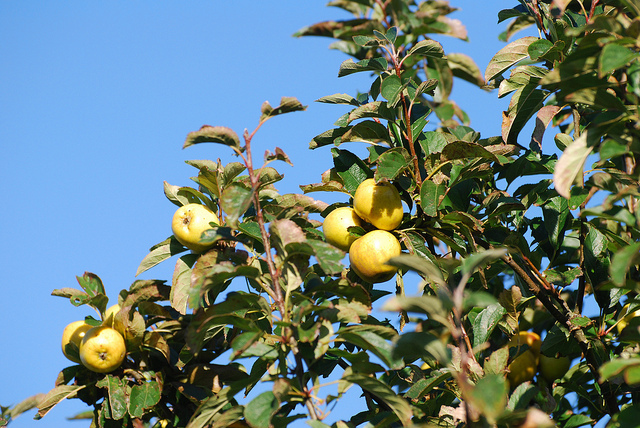 Thinking about planting some fruit trees? Even though the best time to plant is from November to April, when the trees are dormant, it’s now that you should be planning the site, and preparing the soil. That means: manure! Click here to read more. 2. Fruit trees: if you see shoots which are showing damage caused by mildew, these need to be cut out. 3. Aphids and various caterpillars are becoming more active. If young leaves are beginning to curl up and leaves are being punctured with holes or leaves being eaten, it is a good idea to visit your garden centre. These places usually stock a wide choice of ways of dealing with such problems. 4. Shoots which are being damaged by canker need to be cut out by secateurs and removed from the site. The wounds need to be sealed to prevent new infection. “Heal and Seal” or similar products are the correct compounds to use. 5. If rain has been in short supply, watering the trees at this stage is very beneficial to the trees. If the growth of the trees is stunted, weekly foliar feeding can be a real help for the trees to get over the problem. 6. Leaves which have been damaged by the fungus called Peach Leaf Curl, need to be cut off and disposed of in the non-recycling bin. 7. A couple of pruning tips: if the trees are growing too strongly, it is advisable to remove the growing tips of the strongest shoots. Do not prune any espalier, fan or cordon trees until later in the season. 8. For all types of fruit, organic matter and a good soil structure is vital for good growing. This is the perfect time of the year to get your plot well dug, drainage improved and plenty of organic matter added to the soil. 9. If you grow some strawberries, now is the time to place the straw underneath the trusses of fruit. This will stop the mud splashing on the fruit. Also make sure the blackbirds don’t eat the fruit before you do. Netting is essential. 10. Gooseberries and morello cherries are two of the few fruits which do well on the northerly side of a building, shed or fence.